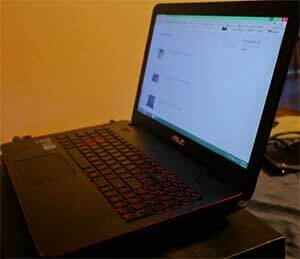 After more than one week usage, I decide to write this ASUS ROG GL551JW-DS71 review. I was searching for a power laptop to do gaming and heavy video editing because I am working daily with computer. This ASUS DS71 fits my expectation pretty well. Skip to the full review. 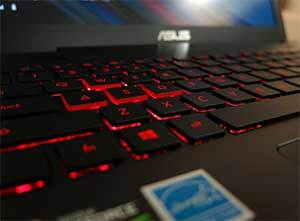 This ASUS gamer laptop doesn’t come with IPS, but with a TN screen just like its predecessor, the ASUS ROG G751JM model. I know you heard a lot of hypes about IPS screen, but the TN screen on this laptop is not that bad. The viewing angles of this non touchscreen ASUS laptop are not the best, but pretty good, text will be a little jagged but that’s texts on a laptop, I haven’t notice any distortions of the colors either, really not that bad. ASUS ROG GL551JW-DS71 is pretty solid built, and it’s absolutely not thin being a gaming laptop, if you look for thinner laptop, then the 13 inch laptops are worth considering. Metal material on the lids, the rest is plastic but it’s clean designed. I find the ROG (Republic of Gamer) logo that will lights up on the lid is looking so nice. The machine can run any games with highest settings without problem, the graphic card is comparable to a mid range gaming desktop – pretty good for gaming laptop at this price. I have run LoL, OSU without issues in high settings. Worth notice, there is framerates fluctuations on my laptop when it is plugged, for instance when I play LoL, I run at 30 fps, it will be 60fps when it is plugged. I guess I can modify the setting in power management, haven’t done it yet. While playing I haven’t noticed any skipping issues, the 2GB nVidia GTX960M can really handle my games and most games that are out right now. The keyboard is something that I really like. The keys are responsive to my fingers, and the keyboard itself is a low profile one, that has matte feeling to it. It is also red backlited, very nice if you use your laptop in the dark, and there is number pad, which was something that I was looking for from a gaming laptop. Be ware though, ASUS ROG GL551JW-DS71 doesn’t have “End” key it uses the “1” key, except if the numpad is disabled. The touchpad is big, pretty big which I need getting used to it, but there is nothing wrong with it. It is different than my older laptop’s touchpad, no button on the touchpad. If I don’t game, standard usage, I can get about 4-5 hours, I can do browsing, watching YouTube, programming, listening to music, etc, but if I game, of course I will get less, slightly less than 2.5 hours. Since it’s a gaming laptop. the battery is still good in my opinion, and its removable. Gaming laptops tend to have heat problem, but this ASUS DS71 does get warm but no heat issue surprisingly. In the left side, there is a single fan which does its job pretty good, you will still have warmer temperature while gaming, but there is nothing about it which will discomfort you. I have the DS71 model, which comes with 1TB Hard Drive and there is another (2nd) bay to add my own SSD. Be ware though, when you do this, it will likely void the warranty, and you need to re-install Windows yourself. For $ 1k, this laptop has 16 gigs of memory, the latest quad Intel i7 processor, and the nVidia GTX960M, what more needs to be said? There is no comparison at this quality and price, check this place first for the fairest deal. I am very happy with this ASUS ROG GL551JW-DS71, and would recommend it to people who are heavy gamer or anyone who want a laptop that is pretty powerful at a fair price. I also got the DS71 and i can’t find the 2nd drive bay. It comes with a HDD installed and no room or slot for anything else.